Preheat the oven to 350 degrees F. Grease each cup in a 12-cup muffin pan with butter, ghee, or nonstick cooking spray. Cube bread and place in a large bowl. Let the bread sit in the milk mixture for about 15 minutes to absorb more of the liquid. Stir once if you like. After 15 minutes (or, when ready to bake), scoop the bread in to the greased muffin pan. Pour any remaining liquid into the muffin cups with the cubed bread. Bake at 350 degrees for about 30 minutes, or until the outsides are golden brown. Let rest 2-3 minutes in the pan, then gently remove from the muffin pan. 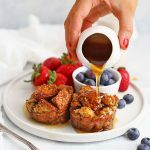 Serve with maple syrup, fresh fruit, powdered sugar, or your favorite toppings!